The major in African American Studies provides focus on the experience of African Americans and their connections to the African Diaspora in the Caribbean and Latin America. Coursework addresses such topics as cultural practices, with reference to literature, history, and film, as well as inequality as it relates to issues of nationality, race, class, and gender. African American Studies provides students with a solid theoretical and research basis to pursue either employment in business and industry or pursue graduate studies. With the African American Studies program, study abroad provides students global engagement that benefits them upon graduation. 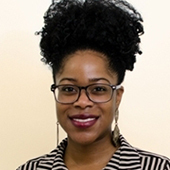 With its focus on the gendered effects of (and gendered responses to) restrictive covenants, Young’s research allows us to grasp the ways in which black women writers staged effective interventions against the forms of bio-political violence that have historically, and continue, to affect black life in the United States. In particular, the dissertation uses ecofeminist theory and urban ecology theory to generate an analysis of how Black women contributed to the ‘sustainability’ of lives, neighborhoods, communities. She also traces roots of a tradition of ecological consciousness and activism in Black America. By showing us how the aesthetic realm (literature) is both a place to document and critique prevailing conditions, while staging activist interventions so as to open up new conditions of possibility, Lethal Housing makes a powerful argument for the critical role that the aesthetic may play in critiquing and reshaping the world, underlining the radical, agential, and devalued role that black women have always played in this process.